Whether your loading trucks have bottom hatches, top hatches or both, we’ve got you covered. SafeRack is the world leader in developing innovative truck loading safety access solutions to enhance both safety and operator efficiency within your truck loading facility. However, our goal is to do more than meet your needs; we aim to exceed your expectations. The process begins with an on-site visit that lets us learn about your daily challenges and objectives. Together, we’ll develop a truck loading safety access solution to help you increase productivity, keep your operators safe and ensure OSHA compliance. 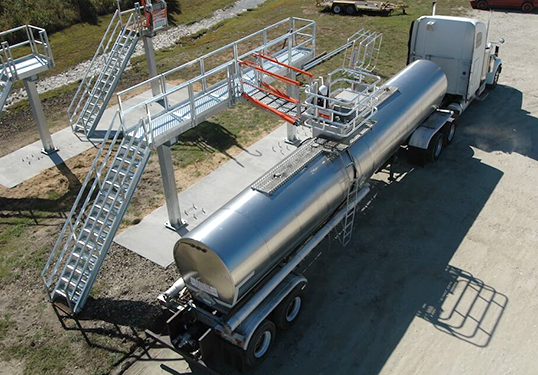 SafeRack is the leading supplier of truck loading safety access platforms and loading systems in North America. We’re also the largest loading arm distributor for both OPW and Emco Wheaton loading arms. So you know you’re in good company when you choose the one company whose name is synonymous with safety. As leaders in the industry, we offer a wide range of loading rack solutions to meet your facility’s demands—including one-of-a-kind demands. No matter how complex your application, we’ll craft a custom platform solution to solve your unique challenges. With years of experience designing loading platform systems, SafeRack’s team of engineers can fully integrate any new solution into your existing application. Regardless of your challenges, though, everything has to work together in a cohesive, efficient and productive way. That’s why we’re here to help guide you. Industrial environments like truck loading facilities are notorious for being harsh; safety access loading platforms take a lot of wear and tear. That’s why we engineered our platforms with heavy-gauge, galvanized steel or aluminum. And it’s why our safety access platforms exhibit unmatched resilience and durability. And you don’t have to wait on a better solution. We’ve streamlined the process by building our base platforms with standard components (we then customize from there), which allows us to deliver your solution quickly. 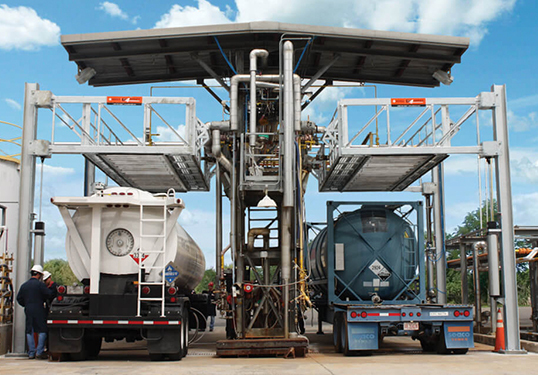 SafeRack loading rack technology provides Nalco with top-of-the-line systems to help their business. Our team of experienced technical supervisors take pride in our fast and easy delivery process. We worked hand-in-hand with Nalco to make sure all of their technical and business needs were met. Safe Loading Access for Any Type of Truck. With SafeRack’s track-mounted safe access gangways, vehicle inconsistency is no longer an issue. You don’t have to stop what you’re doing to move the vehicle. A track-mounted gangway slides horizontally along the platform, allowing workers to safely and easily access any place along the track system without stopping to move the train. SafeRack’s track-mounted loading gangways give operators the flexibility they need to spot vehicles of all types and sizes. This means you’ll speed up your loading or unloading time. And that means you’ll cut costs and increase your overall productivity as a company. Plus, our track-mounted gangways are built with all the same safety mechanisms as our standard gangways. Equipped with a safety cage and a durable, long-lasting design, you can trust your operators will have a secure working environment—today and tomorrow. As leaders in the industry, we offer a wide range of truck access hatch loading rack solutions to meet your facility’s demands—including one-of-a-kind demands. No matter how complex your application, we’ll craft a custom platform solution to solve your unique challenges. The product was delivered like a cheetah with a booster rocket attached to it’s back! The product was delivered like a cheetah with a booster rocket attached to it’s back! I’ve found that I never have to look for another supplier for anything having to do with loading or unloading racks again. What’s left to say? Buy from SafeRack! You will be completely satisfied.